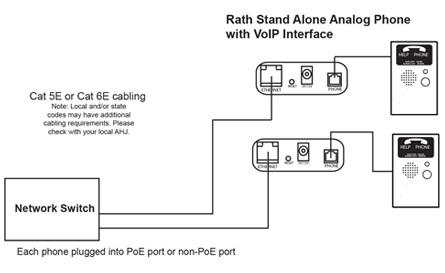 The RATH® IP Elevator Solution includes any of our standard 2100 Series SmartPhones with our 2100-VOIP2CS Interface Device. This will allow you to access your customers SIP phone system utilizing a standard, fully code compliant phone with a simple, hassle free installation. You can either order as a complete system or retrofit an existing RATH® SmartPhone in the field with our 2100-VOIP2CS Interface Device. Requires standard copper run between elevator phone and 2100-VOIP2CS Interface Device. Connect elevator phone to 2100-VOIP2CS Interface Device via a standard RJ11 jack and VoIP Interface to SIP phone system via a standard RJ45 jack. 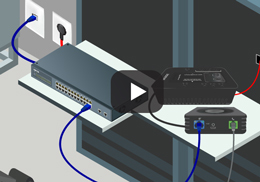 There is a maximum wire run of 300' between the 2100-VOIP2CS Interface Device and the Network Switch.